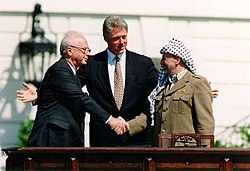 ^ "Yasser Arafat: Homeland a dream for Palestinian Authority Chief". CNN News (Cable News Network). Retrieved 5 July 2012. ^ Aburish, Said K. (1998). From Defender to Dictator. New York: Bloomsbury Publishing. pp. 7–32. ISBN 978-1-58234-049-4. ^ Ben-Yehûdā, Ḥemdā and Sandler, Shmuel (2002). The Arab-Israeli Conflict Transformed: Fifty Years of Interstate and Ethnic Crises. SUNY Press. ISBN 0-7914-5245-X, p. 34. ^ Aburish, Said K. (1998). From Defender to Dictator. Bloomsbury Publishing. pp. 150–175. ISBN 978-1-58234-049-4. Organisation of the Islamic Conference (13–16 March 1989). "Final Communique". The Eighteenth Islamic Conference of Foreign Ministers (Session of Islamic Fraternity and Solidarity). ^ Hillier, Tim (1998). Sourcebook on public international law. Routledge. pp. 128, 218. ISBN 978-1-85941-050-9.